Newly crowned WBA Junior Middleweight champion Demetrius Andrade threw a staggering 953 punches according to Compubox, in his title win over Jack Culcay this past Saturday in Ludwigshafen, Germany. Andrade, who many regard as the most talented fighter in the 154 pound division, showed his versatility as divvied up his punch output nicely between jabs and power punches by throwing 519 power punches and 434 jabs. The junior middleweight average is 684 punches per 12 rounds. Andrade saved his best work for the home stretch when he threw 91 and 92 punches respectively in the Championship (11th and 12th) rounds. In round 11, he connected on a fight best 40 punches. Andrade outlanded Culcay in 11 of the 12 rounds. Andrade of Providence, Rhode Island became a two-time champion with a split decision over Culcay be scores of 116-112 twice and 115-114 for Culcay. “Demetrius showed what a true world champion is supposed to do. He traveled to Germany and took the title from the champion. Now we will look towards the future, and there are many desirable fights out there. There are the champions like Erislandy Lara, Jarrett Hurd and the Charlo /Hatley winner. Of course the big names in the room are Canelo Alvarez and Gennady Golovkin. Those are fights that we would love to make and Demetrius wants them as well. Demetrius will defend his title with pride, and we will look to get him in the most meaningful fights,” said Banner Promotions President, Artie Pelullo. 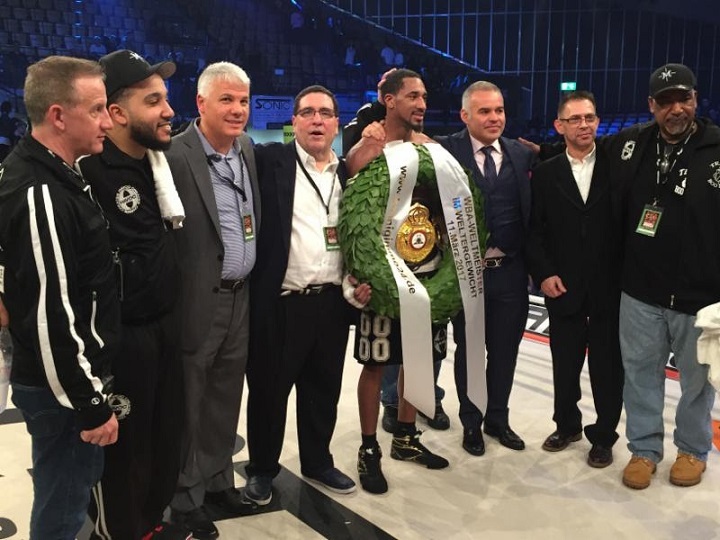 Demetrius Andrade walked into the lions den and came out of it a two-time world champion with a 12-round split decision to capture the WBA Junior Middleweight world title over defending champion Jack Culcay in Ludwigshafen, Germany. Andrade was the superior boxer, who controlled the bout with his combination punching as he worked the body and then came upstairs to the head of Culcay. Andrade kept a solid distance with his jab, that thwarted Culcay’s oncoming rushes. It was a tough grueling battle as Culcay (22-2, 11 KO’s) tried to bull his way in, had some, but little success and, Andrade was consistently finishing off the exchanges with the prominent punches. The fight had entertaining exchanges throughout, but it was the workrate of Andrade that was the difference to the tune of 116-112 twice while Culcay took a card 115-114. Andrade (24-0, 16 KO’s) of Providence, Rhode Island is now a 2-time world champion as he adds the WBA belt to his trophy case. On Saturday night in Ludwigshafen, Germany, Demetrius Andrade became a two-time undefeated World Champion by defeating defending champion Jack Culcay. With the victory Andrade won the WBA Super Welterweight crown. Andrade won by matching scores of 116-112 on two of the judge’s scorecards, but the third judge incredibly had the fight for Culcay by a score of 115-114. Andrade was the superior boxer and controlled the bout with fast combos to Culcay’s head and body. While often Andrade used an effective jab to keep his distance, the bout became a spirited battle with Culcay trying to bull his way in and Andrade often answering back with punches in bunches. Andrade utilized both physical and superior skill advantages throughout the fight as he outfought Culcay for most of the 12 rounds but it was a tough and grueling battle as Culcay (22-2, 11 KO’s) and Andrade (24-0, 16 KO’s) both showed heart and determination in numerous entertaining exchanges that thrilled the sold-out crowd. Andrade set a fast pace from the opening bell using his full arsenal throughout the fight, keeping the game Culcay at bay for most of the rounds. Culcay to his credit never stopped trying and even engaged Andrade in a toe-to-toe battle in the 12th and final round, but Andrade stood his ground and usually had an answer for Culcay’s advances. When asked about future plans, Andrade said: “I just want to fight the best. Line them up, and I will knock all the champions down”. Demetrius Andrade is co-promoted by Joe DeGuardia’s Star Boxing and Banner Promotions .